Dr. Hernando Bacosa, right, catches up with Bert Panahon, Port Captain at CITGO Petroleum New Jersey who also happens to be his relative from the Philippines. Photo credit: Sarah Cosgrove.Scientists from the Dispersion Research on Oil: Physics and Plankton Studies (DROPPS) research consortium at The University of Texas Marine Science Institute were on site to observe a recent two-day drill that was organized by the CITGO Corpus Christi Refinery. The drill involved simulating a 55,000 barrel spill of sweet crude oil from the Corpus Christi CITGO refinery which made its way into the shipping channel via Tule Lake. Drs. Hernando Bacosa and Sarah Cosgrove now have intimate knowledge about who to contact and how to participate in sampling efforts in the event of a local oil spill. This event was the result of a yearlong relationship with the local response groups in an effort to bridge the gap between scientists and responders. Gaining timely access to a spill and the oil is very important. Oil starts to degrade relatively quickly, especially in the heat of the sun, and once that is done, important information can be lost when studying the effects of the oil spill on marine life. Scientists in the DROPPS consortium are very interested in the degradation process of oil after a spill and the immediate and frequent sample collection can yield very valuable information on how spilled oil is influenced by different weathering processes. Also, immediate sampling can help researchers study the health risks to first responders breathing in airborne toxins, the effects of oil on plankton and other marine life, when to apply dispersant and many other crucial decisions that would assist responders in an efficient clean-up process. 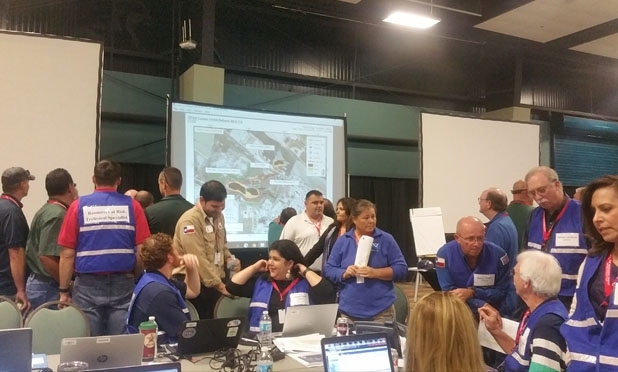 Although CITGO carries out annual drills of this nature, this was the first time all of the local response groups came together to simulate the event and communicate in work groups based in the situation room. The simulated oil spill event took place the morning of November 16th at a dock area in the shipping channel but involved selected participants only. The exercise was headed by members of the local CITGO response team and incident management team in association with various local response groups such as: Marine Spill Response Corporation, Texas General Land Office, Texas Parks and Wildlife Department, and United States Coast Guard (USCG). 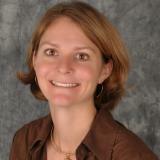 Dr. Sarah Cosgrove participated in the oil spill drill as an invited scientist. Photo credit: Hernando Bacosa.